A live ball thrown out of play during a base-on-balls resulting in an award allowing two runners to score key extra inning runs is our latest Case Play 2017-7: When Base Awards Overlap. Still image of runners' spots at time of throw. The Play: With two out and two on (R1, R2) in the top of the 10th inning of a tied Saltdogs-AirHogs game (American Association Independent Baseball), Saltdogs batter Curt Smith took a fourth ball for a walk to load the bases. After AirHogs catcher Ryan Wagner returned the ball to pitcher Luis De La Cruz, and as the runners were jogging toward their awarded bases, De La Cruz decided he wanted a new ball and tried to exchange baseballs by throwing the one in his possession into the dugout without first requesting "Time" from the umpires. Because the ball was live when it was thrown out of play, the umpires enforced the penalty for a live ball thrown into the dugout by a position player, which is a two-base award for all runners, ultimately ruling that R1 and R2 both scored, while B1 was entitled to third base. AirHogs Manager Billy Martin, Jr. argued the ruling, and was ejected from the game by HP Umpire Kurt Branin. Case Play Question: Replays indicate that at the time of F1 De La Cruz's throw, R2 Nathaniel Maggio had reached third base, R1 Ivan Marin had not yet reached second base, and batter-runner Curt Smith had reached first base. In light of the runners' positions at the time of the throw, what are the proper base awards; was the play correctly officiated? Contingency: (a) Had Smith not yet reached first base, all else equal, or (b) had all runners reached their respective bases at the time of the throw, what would the proper awards have been? Related Post (MLB CP): Case Play 2016-8 - Time Goes Out During Play [Solved] (8/20/16). Answer: Because the ball remained live when F1 De La Cruz released the ball on his throw into dead ball territory after the batter-runner had already reached first base, the proper award is two-bases from the time of the throw (time of release of the throw). R2 is awarded home plate and R1 is awarded third base (last legally touched base was first base at the time of throw). 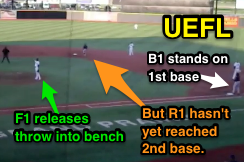 Because no base award can be made for a trail runner that would cause such a runner to overtake a preceding runner, as in Rule 5.06(b)(4)(G) Comment, B1's award is second base even though he was standing on first base at the time of the throw. Contingency (a): If B1 had not yet reached first base at the time of the throw, the base awards would be made at the time of the pitch (last base occupied at the time the pitcher began his delivery [if windup] or came set). Effectively, the result would be the same as R2 still gets home plate, R1 gets third, and the batter-runner gets second base. Contingency (b): If, all else equal, all three runners had reached their next bases at the time of the throw, R2 would still be awarded home plate, R1 would be awarded home plate as well, and B1 would get third base. As the above answer implies, base awards do not overlap: they are awarded concurrently, not consecutively. OBR 5.05(b)(1): "The batter becomes a runner and is entitled to first base without liability to be put out (provided he advances to and touches first base) when—four 'balls' have been called by the umpire." OBR 5.05(b)(1) Comment: "A batter who is entitled to first base because of a base on balls, including an award of first base to a batter by an umpire following a signal from a manager, must go to first base and touch the base before other base runners are forced to advance." OBR 5.06(a)(1): "A runner acquires the right to an unoccupied base when he touches it before he is out. He is then entitled to it until he is put out, or forced to vacate it for another runner legally entitled to that base." OBR 5.06(b)(4)(G): "Each runner including the batter-runner may, without liability to be put out, advance—Two bases when, with no spectators on the playing field, a thrown ball goes into the stands, or into a bench (whether or not the ball rebounds into the field), or over or under or through a field fence, or on a slanting part of the screen above the backstop, or remains in the meshes of a wire screen protecting spectators. The ball is dead. When such wild throw is the first play by an infielder, the umpire, in awarding such bases, shall be governed by the position of the runners at the time the ball was pitched; in all other cases the umpire shall be governed by the position of the runners at the time the wild throw was made. APPROVED RULING: If all runners, including the batter-runner, have advanced at least one base when an infielder makes a wild throw on the first play after the pitch, the award shall be governed by the position of the runners when the wild throw was made." OBR 5.06(b)(4)(G) Comment: "In certain circumstances it is impossible to award a runner two bases. Example: Runner on first. Batter hits fly to short right. Runner holds up between first and second and batter comes around first and pulls up behind him. Ball falls safely. Outfielder, in throwing to first, throws ball into stands. APPROVED RULING: Since no runner, when the ball is dead, may advance beyond the base to which he is entitled, the runner originally on first base goes to third base and the batter is held at second base."